As Arkansas State University and its football team have continued to gather increased interest and support in recent years, the need for a revamped pre-game atmosphere quickly became apparent. Enter Artents, a locally-owned, family-run company that rents and sells custom tents and awnings that has helped make Tailgate City outside Liberty Bank Stadium a fan favorite before home football games. Jimmy Campbell has been a part of the tent and awning industry since finishing high school at Harding Academy in 1978. 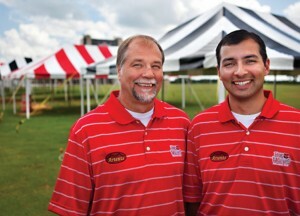 After graduating from the University of Texas at Dallas with a bachelor’s degree in business administration and an emphasis in marketing, Jimmy was hired as sales manager for Tent Systems Inc. His son, Cameron, who attended ASU, has been going on appointments with his father since he was 1 year old. Cameron’s son, Sutton, is now learning the ropes and is included in lots of sales and installations. “Cameron and I started (Artents) eight years ago from scratch with only enough money from Farm Bureau’s deposit to build a small tent and place their name on it,” said Jimmy. “We now solicit business from each of our neighboring states and have had calls from New York, Arizona and the Carolinas. The event rental business has propelled Artents into the spotlight in several arenas. The father and son business partners say that it wasn’t long before they realized Artents was going to be much more than just a place to rent tents. 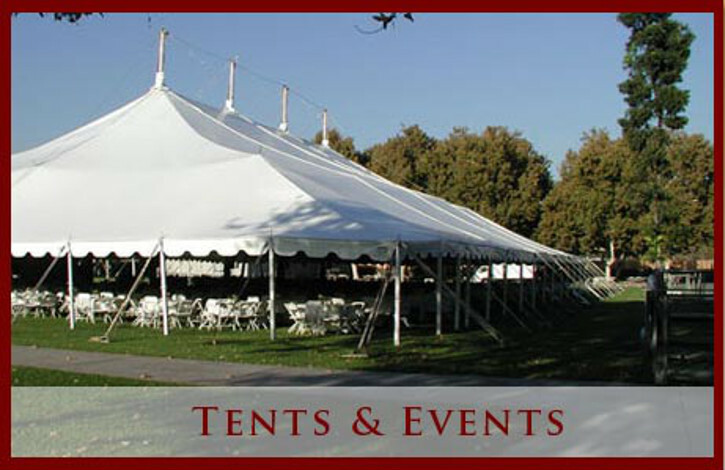 In addition to thousands of square feet of tents for rental, purchase and personalization, Artents now offers tent liners in the form of ornate fabric draping inside tents to offer a more elegant look, tables in various sizes, an array of chairs, dance floors, chandeliers and other lighting options, heating and cooling options and linens in a variety of colors. In addition to the products themselves, the company also offers site inspections, client consultations and more. 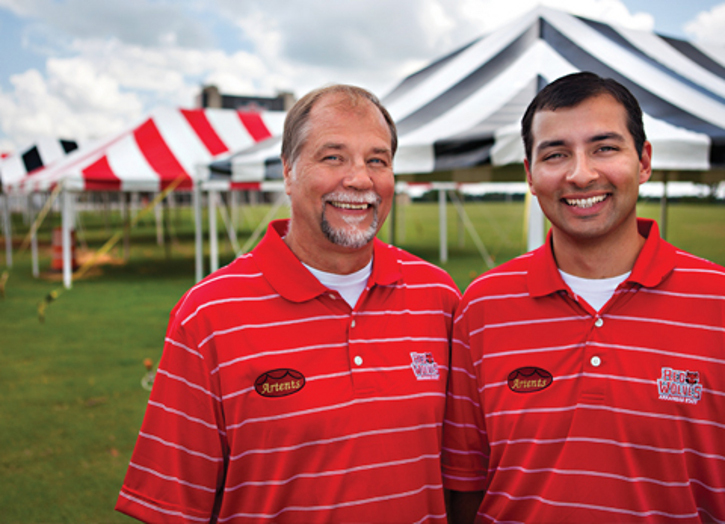 The Artents owners attribute much of their company’s success to ASU and the loyal support of many longtime customers. “Prior to the 2010 football season, we were contacted by Brad Pietz with the Red Wolf Club about an idea,” said Cameron. “We had built a red and white striped tent with a hint of black underneath that a university official happened to see while taking a lunch break. The rest, as they say, is history. Artents uses special software to plot out the tents’ formation, which allows for more tents and better traffic flow in Tailgate City. Each set-up consists of a 20-foot by 40-foot tent, along with tables and chairs, all of which is already set up for fans when they arrive. “We have also had the privilege of setting up events for functions at the chancellor’s home, football (events) besides just tailgating, basketball, other departments’ respective events and many private events held on ASU campus,” said Cameron. In addition to ASU events, Artents works with many other local groups such as St. Bernards, many major factories, area churches, local philanthropists and charities and businesses to help make their events successful. National names such as Walmart, Monsanto and the American Cancer Society also use Artents’ services. The company provided more than 17,000 square feet of tent for last year’s district fair. They have done hundreds of weddings, many of which were very elaborate. “We plan to dominate the convention services industry in this and surrounding states,” said Jimmy. “We love to help businesses in preparation for sales events and help factories prepare to put their best foot forward for their customers, employees and vendors. There are no events that we do not desire to be a part of planning and renting and servicing from conception to fruition. … We wish to be your one-stop, turn-key company that you can depend on to do everything for every event. For more information about Artents, call 935-5000 or go to artents.com. 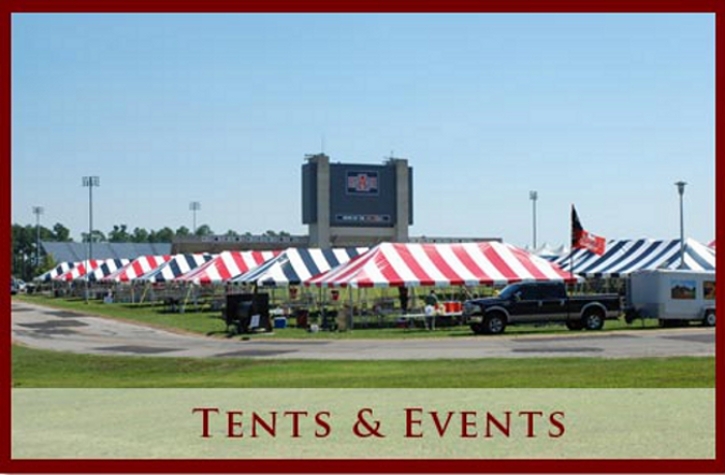 To rent a tent in Tailgate City from The Red Wolf Club, call 972-2401.